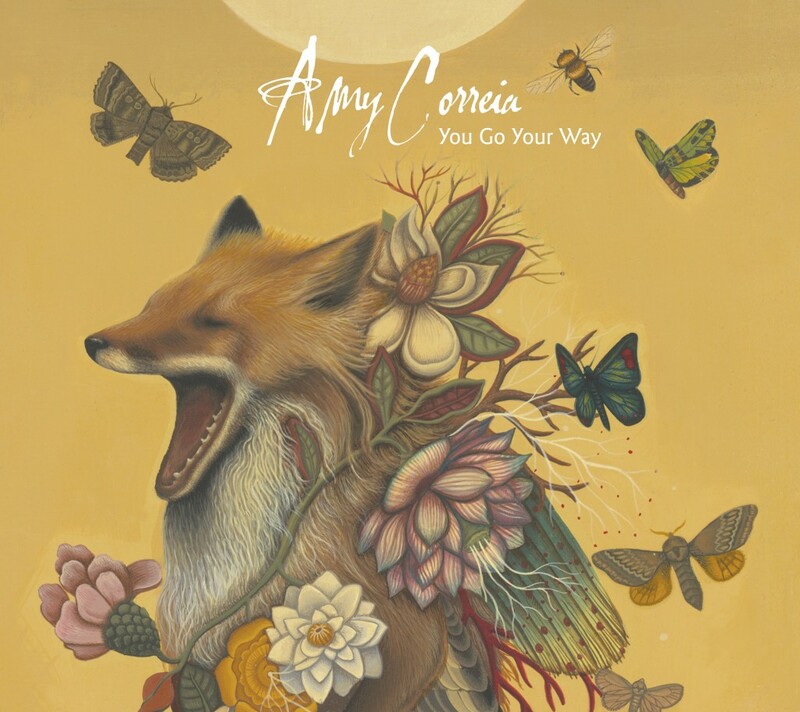 Amy Correia delivers songs with a raw power that’s both vulnerable and fierce. That musical honesty has drawn comparisons to Tom Waits and Michelle Shocked and The New York Times calls her “a singular talent.” After two major releases on EMI, Amy Correia recently scored a creative and entrepreneurial victory by raising more than $35K to produce and release her third record, You Go Your Way. An early convert to the “fan-funded album,” Correia’s new album “veers seamlessly from arena rock to gospel music, that includes both power chords and a string quartet.” (NPR). American Songwriter writes she’s “back in top form with another rootsy gem of an album…Correia shows off her Rod Stewart-meets-Lucinda Williams pipes on Powder Blue Trans Am.” A dynamic performer who accompanies herself on guitar, piano and baritone ukelele, Correia recently returned home from a 28-city tour of the U.S., opening for legendary frontwoman of The Pretenders, Chrissie Hynde. Hynde and her musical partner, JP Jones, hand-picked Correia to open for their new project after seeing Correia perform live. (Her live show is not to be missed!) Correia has also toured extensively with Grammy-winning singer/songwriter Marc Cohn (“Walking in Memphis”), opening shows and performing as a member of his stellar band, appearing on Good Morning America, Ellen Degeneres, The View and The Today Show. Her fans agree, pitching in to raise more than 35k to make Correia’s new record. The energy and urgency of this leap of faith is palpable. You Go Your Way is a spirited ride, covering broad emotional and musical territory. Each song is strikingly individual with Amy’s convincing voice at the center: full of feeling, spontaneity and gravelly soul. Since her last record, Amy has been living what she describes as a ‘nomadic life,’ and some of her own stories seep into songs that relate people and places with poetic flair. Written in various locales including several Brooklyn apartments, a Carolina coastal town, a Wyoming cabin, rural Connecticut and Southern Ohio, the new album finds finds its footing not in any specific place, but an immediacy of experience: An unsentimental boy whose father goes to war in Took Him Away. A determined old soul in O Lord. A sexually frustrated woman “sucking on a Tic Tac” in Powder Blue Trans Am. Correia explores the darkness — and shines a transformative light with pathos and humor. Some songs are reveries on old blues and gospel while others veer off into unexpected new ground. Lyrical spareness and mysticism suggest Nick Drake on Broken/Open and the lushly arranged Rock, Tree, River. The waltzy Old Habits is one part Mary Poppins and one part Ogden’s Nutgone Flake by the Small Faces. A five-piece horn section enlivens Carolina Rail, bringing New Orleans panache to a rollicking narrative that could be Flannery O’Connor meets Chuck Berry. The album “basics” were recorded in only three days by three musicians in Los Angeles: Jay Bellerose on drums, Paul Bryan on electric bass and Correia singing and playing rhythm guitar, baritone uke or piano. Up-and-coming gospel singers Alethea Mills and Chavonne Morris added vocal harmonies a few days later. Producer, Paul Bryan (Aimee Mann), wrote and conducted string quartet arrangements, giving a graceful counterpoint to the album’s lean and driving foundation. “Every since I heard Amy years ago,” explains producer Paul Bryan, “This is the kind of album I wanted to make with her: Rugged, but elegant.” The combination of songs, performances, arrangement and production point to the fulfillment of that vision. Amy Correia hails from and currently resides in the small town of Lakeville, MA. Her father owns the local barbershop. Her early interest in music was sparked by listening to the radio growing up in the 70s, “when Queen was played after a Bob Dylan tune.” Correia reflects, “Followed by Sammy Davis, Jr. singing The Candy Man.” The lyrics and stories captured her imagination as much as the music. She later earned her degree from Barnard and promptly moved to NYC’s Chinatown, performing her homespun tunes on the lower east side where fellow songwriters Jeff Buckley, Jesse Harris, Rebecca Martin and Richard Julian were also honing their skills. Five years later Correia signed a deal with Capitol Records. Billboard called her Capitol debut “an honest-to-God timeless discovery.” After touring extensively around the U.S. supporting John Hiatt, Richard Thompson and Keb Mo, Correia self-funded and then licensed a second album to Nettwerk EMI. The quiet roots-oriented “Lakeville” became a New York Times’ Critics Choice in 2004.